Australian manufacturing’s obituary has been written many times over the past decade. However, we believe these reports are greatly exaggerated. There are attractive investment opportunities in Australian manufacturing, particularly where companies are innovating in this space. This is the first of a series of articles that will highlight where we see such opportunities. Australia has struggled to compete with high volume, low value-add manufacturing due to our high relative wages, strict regulatory controls and the tyranny of distance. Historically our weak currency protected manufacturers from these cost imposts. However, a prolonged period of at or near USD/AUD parity through to early 2015 rang the death knell for many of our “widget” producers. Since the Global Financial Crisis, Australia has lost around 200,000 manufacturing jobs and with the imminent closure of the remaining car manufacturers in Victoria and South Australia, this number may worsen. To put the state of general manufacturing into perspective, 30 years ago, 16% of Australians with a job worked in the manufacturing sector. Today, this number is 7%. Why would Acorn Capital invest in Australian manufacturing? General manufacturing may have been a wrecking ground for capital in Australia in recent years. However, the key differentiator for investors in the sector is innovation. Innovate or die. Our focus in the industrials sectors is on what is termed “Innovative Manufacturing”. In this context, we regard innovation as new ways to do old things better or more efficiently. Clearly, Australian manufacturing is going through a transition. However, through innovation there are exciting green shoots. The dire state of the manufacturing sector over the past 20 years has forced change, as has the highly skilled nature of Australia’s workforce, both white and blue collar. This innovative approach to manufacturing has encouraged the development of niche, low volume, highly technical products for world markets. Our portfolio includes a number of innovative manufacturers who specialize in niche products or markets, where technical smarts enable Australian businesses to compete in global markets. A high profile innovative manufacturing investment of Acorn Capital is Carbon Revolution (“CR”), a Geelong-based private company that manufactures light-weight, single-piece carbon fibre wheels for the automotive industry. CR expects to expand into aerospace in coming years. The genesis of CR came about when Deakin University student engineers and their mentors developed a lightweight wheel from composite materials for the University’s entry into the Formula SAE racing competition. Following the success of the initial prototypes additional engineers, scientists and Research & Development (R&D) specialists joined the development program and CR was born. The R&D background of the CR founders has been complemented by a number of car manufacturing specialists, who have joined the business from the likes Bosch/PBR, Ford, Toyota and Holden, as these businesses exit the Australian market. Carbon wheel demand is a result of the quest of automotive manufacturers to lower the weight of cars, due to increasingly stringent global carbon emissions standards. Carbon fibre wheels are approximately half the weight of comparable alloy wheels and reduce the unsprung mass of vehicles. Consequently, carbon fibre wheels permit weight savings in other areas including vehicle suspension systems. The result is a car with lower fuel consumption. Approximately 425 million steel and aluminium wheels are produced annually—and if CR can capture a small proportion of this, the opportunity is very, very significant. CR has secured Original Equipment Manufacturers (OEM) supply contracts with Ford Detroit and at least one other global OEM, confirming the market share gains have begun. 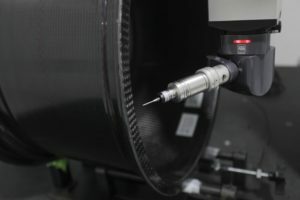 The Geelong region in Victoria has become a recognised location for advanced materials commercialisation and CR enjoys support from CSIRO as well as Deakin University’s carbon fibre research centre (Carbon Nexus), ensuring CR is at the forefront of composite materials engineering and manufacturing globally. In fact, CR’s head office and manufacturing facility are located within the grounds of Deakin University and within walking distance of CSIRO’s composite materials research facility. CR is also active in the aerospace sector, with potentially significant weight savings (and therefore fuel savings) for aircraft by switching from aluminium to carbon fibre wheels. The first phase of development work has been completed, with material assessment and selection and initial engineering feasibility work finished. Over the next 12-18 months CR expects that prototype parts will be engineered, produced and ready for testing in North America. Whilst a longer-term driver of growth, the potential opportunity is significant and will further support valuation upside for our investment in CR. What attracted Acorn Capital to Carbon Revolution? 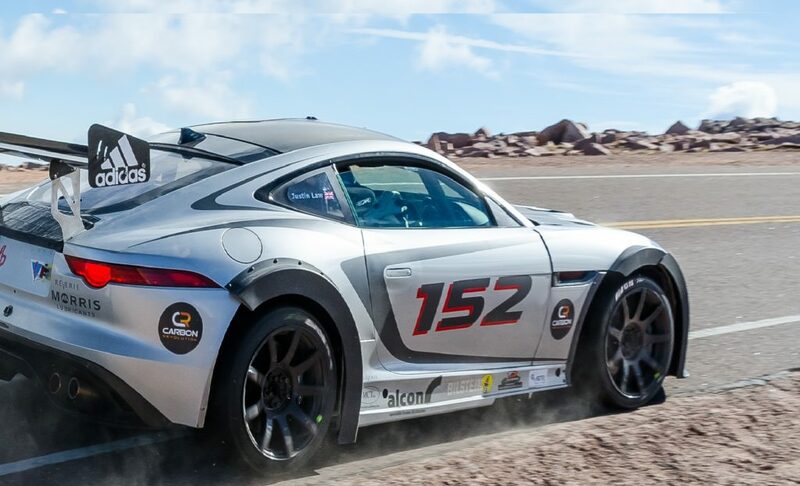 CR is a world-class R&D and engineering firm that has commercialised its product and is now rapidly scaling to meet the demands of OEM car manufacturers globally. Whilst the high initial cost of the CR wheels means that they are currently best suited to performance sports cars, such as the top of the range Ford GT and Mustang GT350R, CR has recently signed other OEM contracts with global manufacturers that will deliver scale benefits to manufacturing costs. As CR continues to improve its manufacturing processes through innovation and automation, the cost of the wheels should reduce substantially, making them available to a much more diverse range of vehicles (and consumers). Evidence of these scale benefits can be seen in CR’s recent 25% price cut for its aftermarket, non-OEM wheels. Economic theory suggests as CR moves down the cost-curve, demand for its products will increase as prices reduce. CR appears to be 2-3 years ahead of the competition with its single piece product, giving it a significant competitive advantage in the market. Additional contract wins should drive volume growth and therefore top-line revenue growth over the coming 5 years and this will support a material improvement in profitability as scale benefits are enjoyed and manufacturing costs fall. 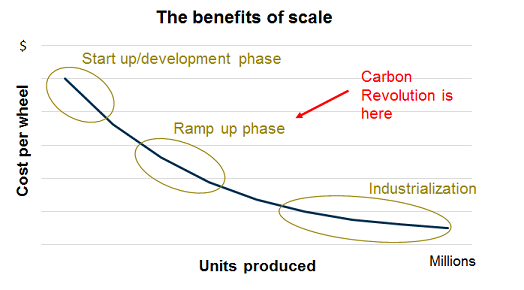 Acorn Capital’s investment in Carbon Revolution is driven by a belief that as the business scales up with additional volume from new contract wins, manufacturing costs will continue to fall and gross margin increase. This will take time, but the business is well progressed in automating its manufacturing process and it continues to innovate ways to make its wheels more competitive. This margin improvement will be supported by strong top line revenue growth as vehicle manufacturers chase weight reductions in their cars to meet increasingly stringent environmental standards. Find out more about investing in emerging Australian companies through Acorn Capital Investment Fund Limited. Past performance is not a reliable indicator of future performance. The information in this website is general information only and does not take into account the financial objectives, situation or needs of any particular investor. Before deciding whether to acquire, hold or dispose of a product, an investor should refer to relevant ASX disclosures. Nothing in this website contains a recommendation to buy or dispose of any of the stocks noted. Any examples or information provided in this article are for illustrative and discussion purposes only and do not represent a recommendation or view on future events, and in no way bind the publisher of this website or its related parties.